Tracy is thrilled to be a part of the teaching staff at Beacock Music. Her musical experience is expansive and she loves engaging with different types of people. Music has always been a huge part of Tracy’s life. She started taking private piano lessons from her mom at age eight and continued taking lessons all the way through college. Accompanying for choirs has been something Tracy has enjoyed since high school – both volunteering and playing professionally. She loves to look back over the years and see how music has enhanced so much of her life - intellectually, spiritually, socially and personally. A significant component of Tracy’s musical growth was in her college experience. She enjoyed studying Piano Pedagogy with Professor Mary Kogen at Portland State University. She continued studying music as a Music Major at Mt. Hood Community College where she earned full ride scholarships for accompanying for the concert and chamber choirs, and private vocal students. Earning her Bachelor of Science in Music Education at Warner Pacific College was one of Tracy’s successes. She studied piano from Ruth Ann Yerden, earned scholarships for accompanying for the concert choir, Warner Chorale, and jazz choir. She also enjoyed tutoring the music theory students, creating and planning general music curriculum, playing in a chamber ensemble, touring with the choir to Germany, and planning and performing her own solo senior recital. Being involved in the music field has continued to be very important to Tracy. 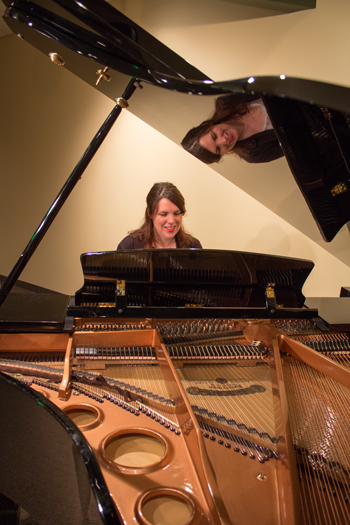 Soon after graduation, Tracy taught private piano lessons at the Portland Christian Center School of Music. Music Directing for Christian Youth Theater, and now Journey Theater Arts Group has been a highlight. She has loved coming along side cast and band members through conducting and playing, and enjoyed the creative atmosphere and good teamwork. Playing on her church worship team as a lead pianist, and backup keyboard player has been very important to her and she also loves mentoring younger musicians in the worship arts area. Connecting with piano students of any age is something Tracy is very passionate about. Her broad experience has made her comfortable in teaching piano students and helping them explore their unique musical pursuits. If you have a question for Tracy, or wish to contact her, please fill out the form below. The message will be passed along to the Education Center and they will get back to you.